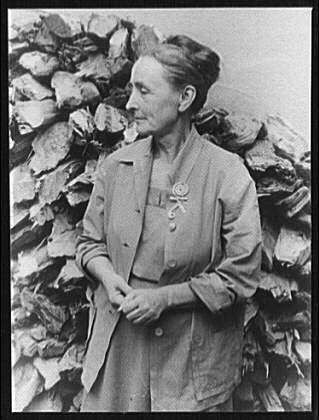 Georgia O’Keefe was a famous American painter known for her landscape paintings as well as her artful depictions of desert flowers, animal bones, shells and rocks. She was a widely recognized painter and a major figure in the art scene during the 1920’s. She has helped stretch the boundaries that defined the American artistic style by dabbling in both abstract and representational art. Georgia O’Keefe was born on November 15, 1887 in Sun Prairie, Wisconsin. She was the second of seven children born to Francis Calyxtus and Ida Totto O’Keefe. Georgia’s parents were both dairy farmers and the O’Keefe family were raised largely on a farming community. Georgia’s talent for the arts was evident early on which encouraged her parents to let her take art lessons and classes along with her other sisters. She initially studied art under a local watercolorist. After high school, Georgia then went on to enroll at the School of the Art Institute of Chicago in 1905. She then went on to attend the Art Students League in New York City in 1907. In 1908, having been discouraged with her own works, Georgia decided to move back to Chicago and found work as a commercial artist. During this time, she never took up a paint brush and took time off from painting. She also worked as an elementary school art teacher near Amarillo, Texas. It was later on, around 1912 that Georgia was inspired to take up painting once again. She was introduced to the innovative ideas presented by Arthur Wesley Dow that encouraged artists to express themselves through elements of art composition rather than just copying nature. It was sometime in 1916 that Georgia O’Keefe’s work was noticed by 291 gallery owner Alfred Stieglitz. Alfred encouraged and convinced Georgia to exhibit her works through his gallery in New York City. The partnership between the two began as a creative partnership that blossomed in romance. Georgia and Alfred got married in 1924. The partnership also became a great force that allowed Georgia to become well known in the prestigious art circles in the US. Soon, her paintings became known after being displayed on annual exhibits organized by Alfred. Her works began to command high prices which further fueled additional media attention to Georgia’s work. Aside from urban and architectural images, Georgia also began painting flowers. Her paintings were unique in the sense that they exuded life and energy through the interplay of light and dark. She was one of the first American modern painters who have painted in a distinct manner that can easily be associated to only be her own. Georgia O’Keefe went on to become a highly regarded artist even after her old age. She died on March 6, 1986 at the ripe old age of 98.